The Foundry building has been sitting empty and the time has come for the City of Cambridge to decide its new use. 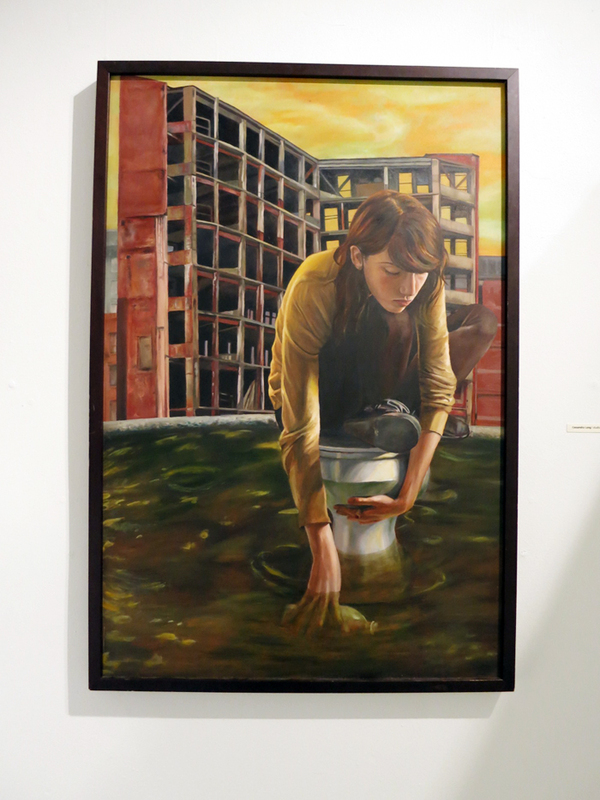 This past Saturday, the City allowed local artists to hold an event to explore the possibility of using the Foundry as a public art space rather than selling it to a commercial buyer. The event offered the chance for local artists to show the city what they can offer and the crowd they can pull in, while also allowing fellow artists and community members to see the space being discussed and sign a petition to the city in favor of maintaing the building as a public art space. I dashed over to The Foundry over my 1/2 lunch break from work down the street so I couldn’t stay long, but I was impressed by what I saw. Art Groups and Artists from accross Boston including The Lilypad, The Hallway Gallery, The Blanc Gallery, Voltage Coffee, and many more joined together to make the event happen in less than a week. 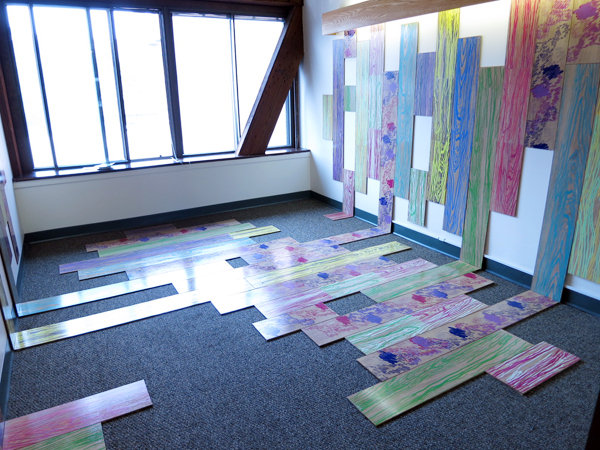 Music and art filled the expansive central space and transformed the outer offices into galleries. 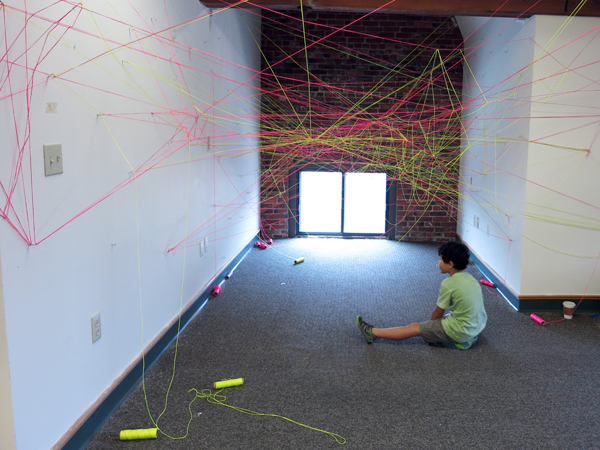 I especially enjoyed the way Jess Anderson’s sculptural installation repurposed a former office space. Victor Genel‘s sculture was created completely from folded business cards. The Foundry Equation had an air of excitement and potential throughout – a 10,000 sq ft public art space in the heart of Cambridge would be exciting indeed. Learn more about the Foundry Equation here and sign the petition here. 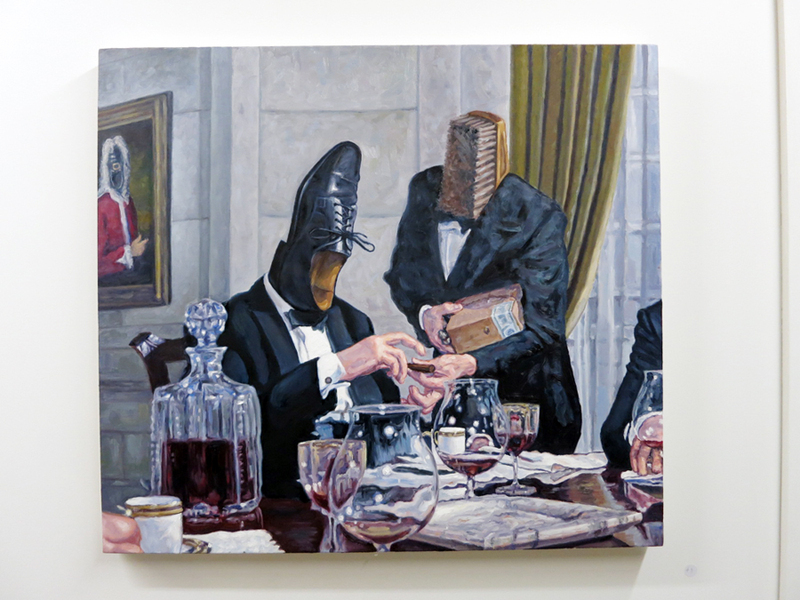 Location: Anthony Greaney Gallery, 450 Harrison Avenue, No. 1, Boston MA. 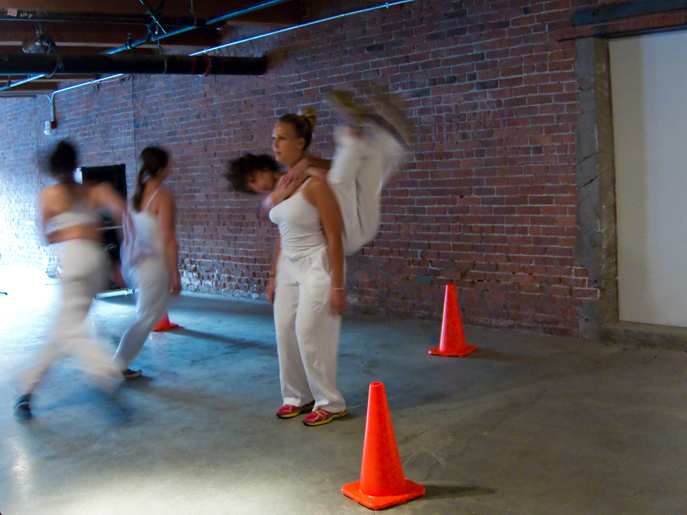 Mobius held a performance art extravaganza at Studio Soto this past Saturday – lasting from 7-11:30pm and featuring 21 different performances, SPEED was quite the event. Despite its long duration, I was captivated from beginning to end. The performances were polished and the transitions between them were smooth and orchestrated down to the minute, such that every time one came to an end the audience had to spin around to locate the next performance. I was impressed with the high level of audience participation throughout the evening, whether in the form of needing to move around the shifting performance area or being directly engaged by the artist in the performance itself. 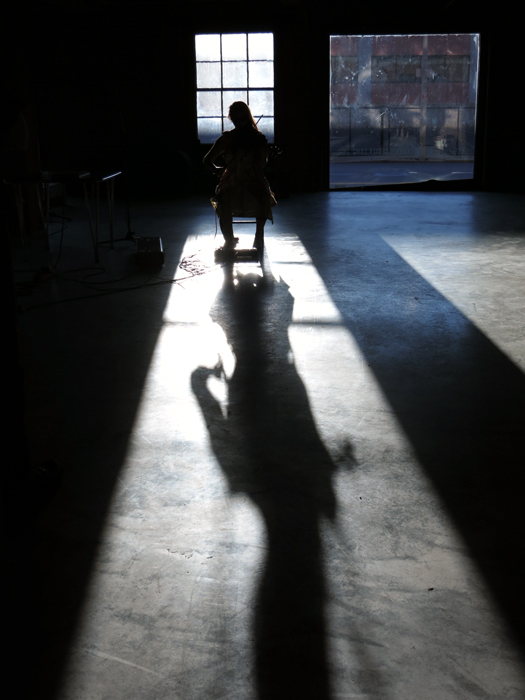 Karthe Hostetter bewitched her audience with electric looping violin and dramatic lighting. 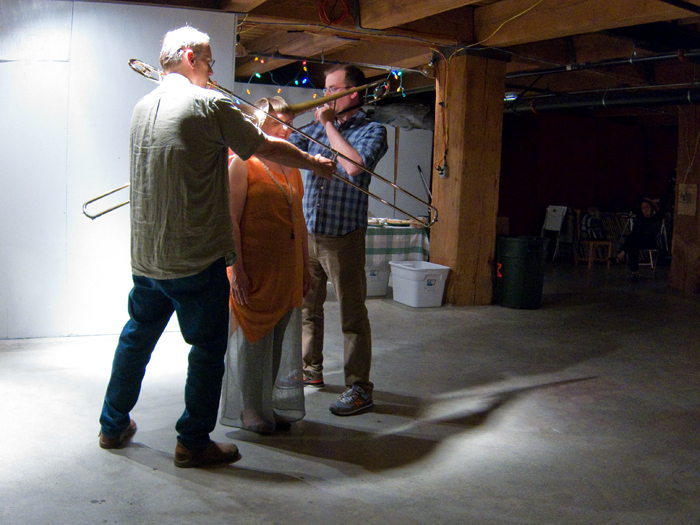 Trombonists Tom and Ryan offered “trombone sandwiches” to eager volunteers. Although a few lucky audience members received their own personal ear concerts, the rest of us got to watch as their expressions shifted from wary to surprised to gleeful, even the most unsure participant soon unable to hold back grins and giggles. Andary Dance wound in and around onlookers, combining speed, interpretive dance, and incredible precision. Jimena Bermejo-Black proved that performance doesn’t require polished speech. Her impersonal and confessional dialogue and utmost trust in her audience drew us in as she performed her midlife crisis blindfolded, wrapped in bubble wrap, and to the tune of a song selected by an audience member. Jessica Borusky never fails to impress, using her impeccable sense of timing and personal rhythm to explore the fidgety agony of waiting, the explosion that happens when someone snaps, and finally, with over 100 “I’m sorry”-ies, a failed attempt to re-conform to polite expectations. Jason Sanford DJed as Liz Roncka dance/twitch/exercised, displaying incredible muscle control with an intensity that made all my muscles tighten up just watching. Kirk Amaral Snow showed strength and commitment as he transformed his legs into feet of sand. Sara June took on the persona of the Fastest Woman on Earth. 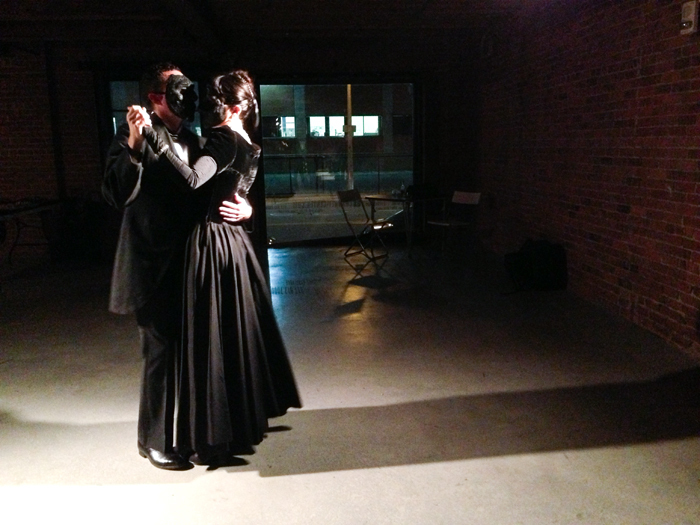 Towards the end of the evening, Ian Deleón and Anabel Vázquez performed a slow dance that was one of the few performances of the evening that did not break the fourth wall and maintained an air of the theatrical throughout. Deleón’s solo show, Cuba + Puerto Rico: Invitación a Volar, (which I wrote about previously here) is still on view at La Galería through June 21st. Moments from the many performances have kept popping into my head over the past couple days as I work to process them all. With both faces I knew and loved and new artists I now plan to look out for, SPEED was an evening to remember and a testament to Boston’s thriving performance art scene. When: Opening June 14, 6-8pm. On view June 13 – 14. When: Opening June 13, 6-8. On view June 13-29. 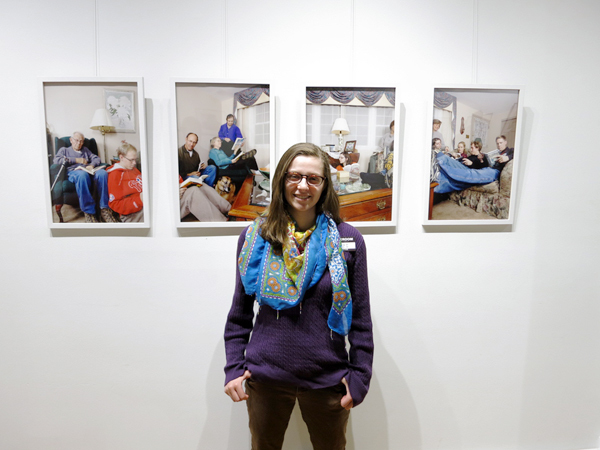 I left work early on Friday to drive up to Essex Junction, VT for the Artists’ Reception of We Are Family at the Darkroom Gallery. I decided to apply to the show back in April because it was being juried by Chris Verene, a favorite photographer of mine. 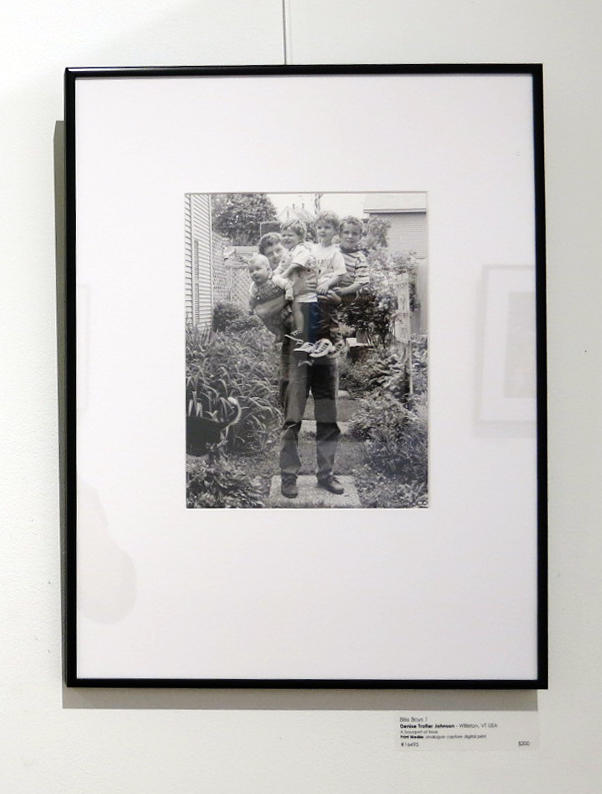 I enjoyed seeing what Verene chose to represent the theme of family and was honored to be chosen, when his own photographs of his family are so distinctive. My favorite photos in the show were the ones that took everyday moments and combined them with a sort of surreal elegance. 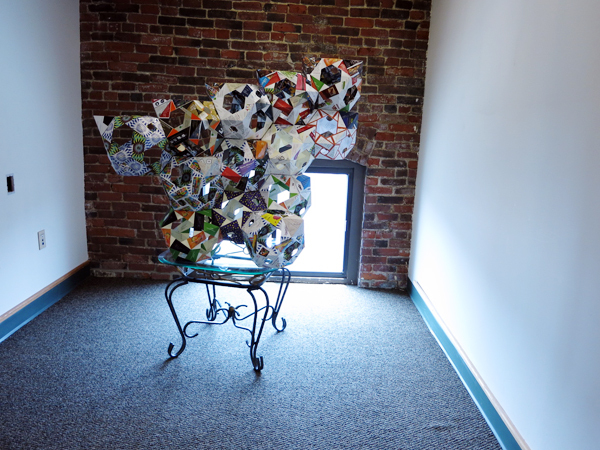 If you find yourself in Vermont, you should definitely check out the show, up till the 23rd. Sunday was hot hot, but I was able to enjoy South Boston Open Studios at The Distillery by taking it slow to take in all the cool art. The Distillery is a unique space – a historic brewery converted into artist work and live/work spaces. It was strange and wonderful to walk through closets and living rooms and emerge in studios filled with art. With her spacious studio hall, the sculptor Joyce McDaniel seemed to be a bit of an outlier in the Distillery, but in the best way possible. Her elegant sculptures soared above visitors heads, immense without being ungainly, their layered-paper construction giving them a sense of lightness. Of all the work I saw on Sunday, it was Derek Hoffend‘s sound sculptures that truly made me stop and pay attention. Hoffend has previously taught in the Museum School’s Sound department and has a background in electrical engineering, but has studied sound design and sound architecture extensively. 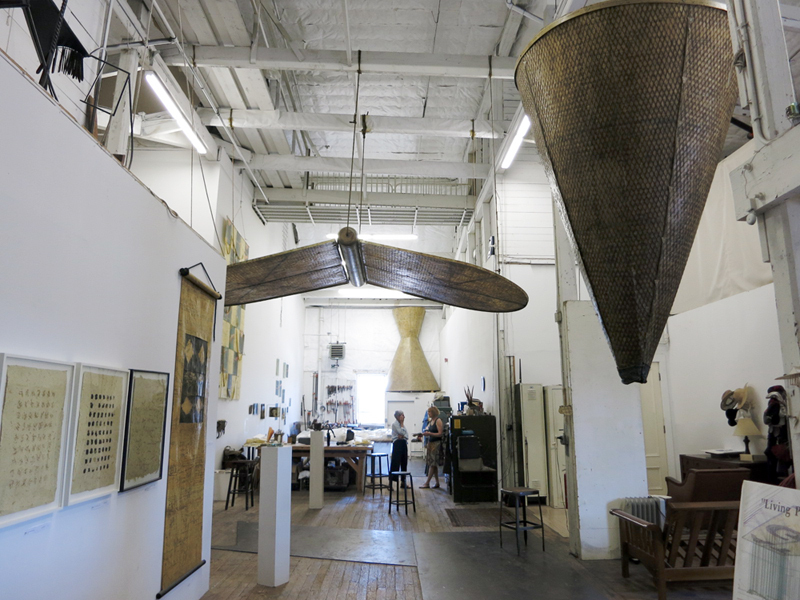 Upon entering Hoffend’s studio, visitors were greeted by a pleasant drone-hum coming from the sculpture’s speakers. Hoffend draws his sound samples from sources such as brain-wave tones and notes associated with yoga chakras, these tones then create live and constantly changing music based on a set algorithm. 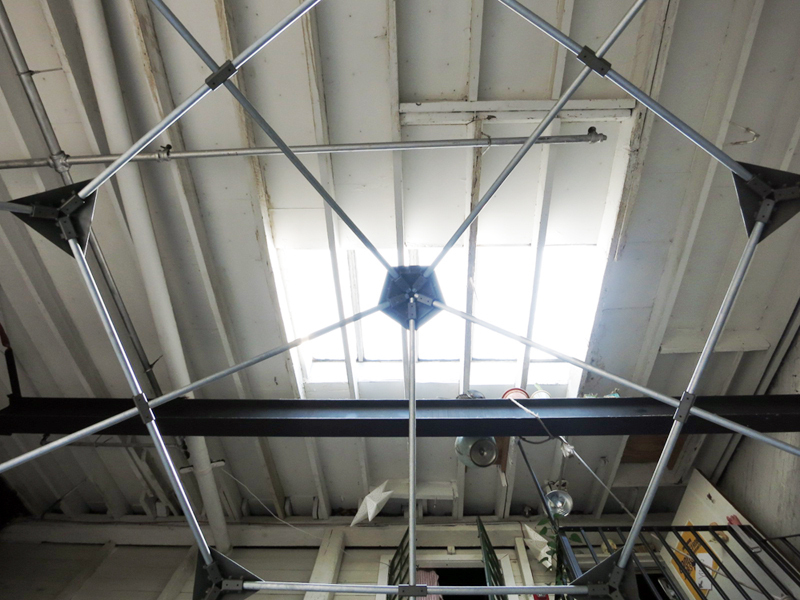 A geodesic sounds sculpture installed in Derek Hoffend’s studio. Hoffend’s sculptures combine geometry, sound design, sacred forms, and healing energy. In a less capable artist’s hands, the outcome could have been hokey or “new-age”, but Hoffend is so sincere and thoughtful in his execution that his sculptures feel like true instruments of healing. Hoffend’s sculptures are polished and professional – healing involves a great deal of trust, and I felt no hesitation when climbing into the sculpture. 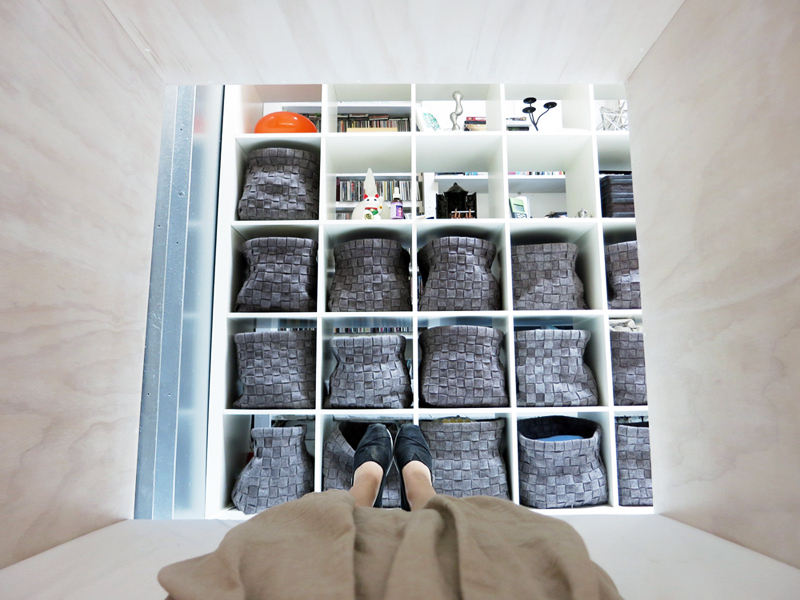 Lying inside the sound dome. I have a chronic pain condition, so I’ve spent a good amount of time investigating non-traditional healing methods, and while I wasn’t expecting to find one at the Distillery, I was open to the experience. Lying inside the sculpture was incredibly calming and peaceful. The mattress base lay on a second lower ring of speakers, which emitted low frequency vibrations that felt wonderful on my spine. Although I only stayed inside the sculpture for around five minutes since others were passing through, it was hard to leave! Inside the “Incubator” sound sculpture. I’m glad I made the hot trek to the Distillery for Open Studios, I knew it was somewhere I needed to check out, I just didn’t know quite how full of life it would be! Radical Film Night: FREEDOM for OSCAR LÓPEZ RIVERA NOW!